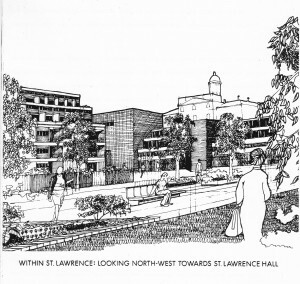 The first known depiction of St Lawrence Neighbourhood – a conceptual sketch included in the City Housing Department report “St. Lawrence: A New Neighbourhood for Toronto”, 22 May 1974. Earlier this month, it was Jane’s Walk time again in Toronto, and thousands were out this past touring various urban locales under the guidance of local experts. It is a remarkable success story, this concept, and a fitting legacy for someone who conceived one of the most influential books of the twentieth century on the basis of what she observed walking about the city. Among the options this year was a tour led by former city councillor and now Liberal Member of Parliament Adam Vaughan titled “Lessons from a Great Neighbourhood” that began in the celebrated St Lawrence Neighbourhood, an area that, the promotional blurb tells us, “was built in the 1970s by some of our City’s greatest visionaries including Jane Jacobs”. This assertion prompted an eye-roll, from me at least – an eye-roll I have done before and am likely to do again. Jane Jacobs did not build St Lawrence Neighbourhood anymore than Frank Lloyd Wright designed my suburban childhood home. The question of who did design St Lawrence, a unique residential patch of south-east downtown Toronto, is one that I, as a historian, undertook to answer several years ago, and after reading the key documents and interviewing several central participants I came up with two answers. One is that it is hard to say because many people had a hand in it. The other is that Jane Jacobs definitively was not one of those people. The first I have had no trouble conveying to Toronto people. The second I have had much more trouble conveying. Telling Torontonians that Jane Jacobs did not design St Lawrence is a little like inserting water into a stone, a fact that I find both frustrating and fascinating. Determining who created the look and feel of any urban neighbourhood is no simple task. We know the designers of buildings, the high profile ones at least – in Toronto we know that Mies van der Rohe did the T-D Centre, and Daniel Liebeskind the new ROM addition. But trying to identify who created, say, the core of Yorkville, is nearly impossible. This inscrutability, of course, flows directly from the fact that urban landscapes are an expression of the many interests, tastes, and laws that prevailed at the time of their creation – which is, in turn, why landscapes are such telling historical sources. 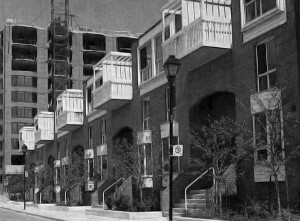 The two principle design elements of St Lawrence Neighbourhood: traditional, street-facing urban townhouses and mid-rise apartment blocks, both taking shape c.1980. Canadian Architect, June 1981. But what about St Lawrence, a neighbourhood described by architectural journalist Dave Leblanc a few years ago in the Globe and Mail as the “best example of a mixed-income, mixed-use, pedestrian-friendly, sensitively scaled, densely populated community ever built in the province”? Being so celebrated, perhaps its ‘designers’ can be identified. There are plenty of possible candidates. Alan Littlewood, a British-trained architect employed by the City Housing Department, is usually the first name suggested. But documents from a year prior to his hiring show many of the neighbourhood’s concepts already well developed, prompting one to consider senior city staff in place before him – notably Howard Cohen, Director of Neighbourhood Planning, and Michael Dennis, Commissioner of Housing. Both had an unmistakable influence, especially Dennis who more than one participant has told me is the most important individual. But he did not lay out the streets or choose the building types. That was the job of a group of city staff (which included Littlewood), a few design consultants (the architect George Baird’s contribution is well known), and a “working committee” of interested citizens (they were not local residents since the area was uninhabited) chaired by the assertive city councillor John Sewell. Then there is Jane Jacobs. She lived in Toronto in the 1970s and knew Alan Littlewood personally, and many believe that she somehow transmitted her ideas into the project through him. It is hard to completely dismiss this – who knows what they talked about over dinner? – though Littlewood himself downplays it But there is no sign of her having any direct personal influence on the design. Her ideas were in the air at that time, of course, since almost everyone in urban planning and design had read her best-selling Death and Life of American Cities by then (though not Littlewood, until after he began working on St Lawrence), but that is the extent of it. And in any case Jacobs did not really propose how neighbourhoods should be designed in her writing; her focus was more on how they should not be designed. 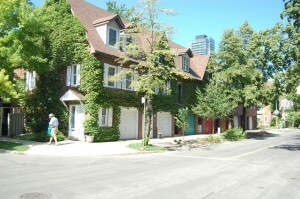 The faux-historic townhouses of the neighbourhood, built in 1980, have begun to look more authentically historic as the street trees mature and ivy climbs the outside walls. Author photo, June 2012. In the end one cannot say who designed St Lawrence. It was a product of its times, which is to say 1970s Toronto. As one walks its streets today one is encountering the legacy of numerous ideas and institutions from that time: a newly-elected reform council and its vigourous new housing department, generous federal government subsidies to housing, a new-found faith in social mixing, disenchantment with conventional public housing, the low-rise/high-density trend in architecture, and the rediscover of inner-city living. Such is the richness of an urban landscape. And such is the rich, not to mention barely-explored, historical tapestry of Toronto at that time. Why then do people keep naming Jane Jacobs? Admittedly I have not made a concerted effort to disabuse the population of its mistaken idea, nor do I have any wish to do so, but I have had enough casual conversations to know how difficult doing so would be, and that intrigues me. Part of it might be the convenience of associating historical events with individuals – from Champlain’s founding of Canada to the “Age of Trudeau” – a simplification of history that continues despite historians’ efforts to complicate things. But surely a bigger part is the desire to claim association with a famous person. Having Jane Jacobs a part of Toronto somehow makes the city a little more important. But whatever the cause, naming Jane Jacobs as even one of the builders of St Lawrence both exaggerates her direct impact on the city and diverts our attention from the many interesting Toronto people and circumstances that did produce St Lawrence, and that the neighbourhood today so vividly reflects. Richard White is a longstanding part-time lecturer in Canadian history at University of Toronto, the one-time Research Director of the Neptis Foundation, and the author of a forthcoming history of Toronto planning with UBC Press.